Here is an incredibly moist hot fudge cake for those who like a very sweet treat at the end of their meal. 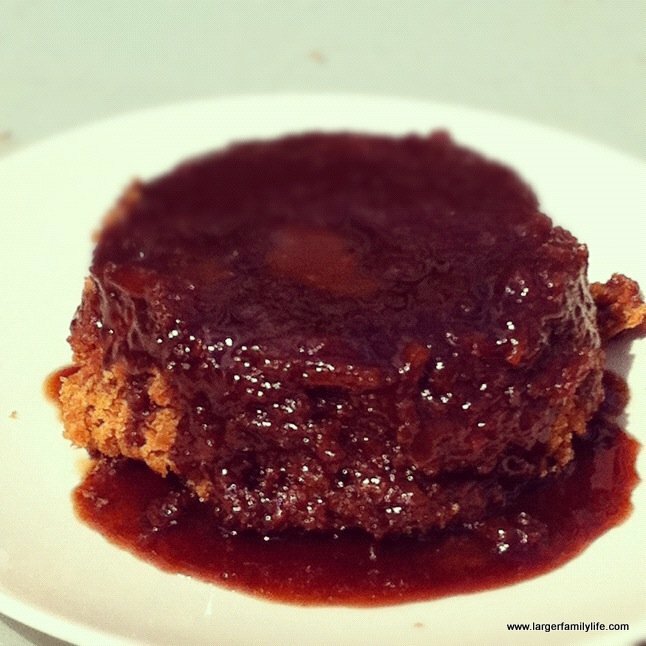 This hot fudge cake can be made quickly and easily and left to cook in the slow cooker over 3 or 4 hours. No oven needed and very simple to make! Serve it warm with a scoop of ice-cream for the perfect taste combination. This recipe makes two 14cm cakes. Take two 14cm bowls and grease well. Set to one side. Place two crumpet rings at the base of the slow cooker. If you don’t have any crumpet rings available you can use some scrunched up foil. This will create the base for your bowls to sit on. Pour an inch or so of boiling water into the slow cooker bowl. First prepare the fudge sauce. In a pan stir the boiling sugar and water together over a medium heat until the sugar has melted. Add the cocoa powder and stir well. Divide the fudge mixture between the two bowls. Now you can create the cake mixture. Stir in the brown sugar then add the milk and melted butter. Mix well. Divide the mixture between the two bowls on top of the fudge sauce. Loosely cover each bowl with foil then place the bowls into the slow cooker. Serve the fudge cakes immediately, turning them out upside down before dishing up. The fudge sauce will run over the edges coating the cake. Serve with a dollop of ice cream. Be warned though, it’s very sweet! Don’t forget to check out some more of our recipes before you leave and make sure you subscribe to Larger Family Life by email to have new recipes delivered directly to your inbox.